Map your domain name, choose a theme and you instantly have a beautiful face to your website. 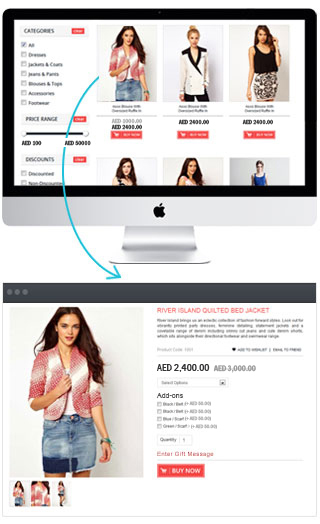 With CCAvenue Store Front, you have complete control over your website's navigation, content pages and design. Every theme has its own unique settings which can be easily customized as per your desire. CCAvenue Store Front is optimized for any device using Responsive Web Design approach thereby providing an optimal transacting experience for your customers on-the-go. With CCAvenue Store Front, creating product categories, updating inventory, creating SKU's, managing customers and running your online store is so easy and intuitive that you don't need any technical knowledge! Shipping rates can also be set up in a number of different ways, including fixed-price, tiered, weight-based and location-based rates. Hosting and managing your entire web store will never be that easy and hassle-free. The CCAvenue Payment Gateway is seamlessly integrated in the CCAvenue Store Front thereby enabling you to use all the features that India's premier payment gateway has to offer. Collect payments across the globe in 27 currencies and allow your customer to pay in the currency they know best. Simple, convenient and frictionless checkout experience that facilitates speedy transactions, better customer retention, and encourages repeat purchases. With CCAvenue, you can be assured of highest level of data security standards. CCAvenue Store Front includes built-in analytic graphs and real-time statistical reports with complete transparency to get a 360° view of your business performance in the competitive online industry. Our insightful data analytics helps analyze performance and maximize your business potential. Sell products and collect payments in-stream across social network instantly and reach out to fans, friends and followers through social media through CCAvenue S.N.I.P. Design personalized invoices and send it to your buyers on recurring intervals. Also, you can send invoices to multiple customers at the same time using CCAvenue Invoice Payment System (I.P.S.). Collect payments securely over the telephone through an automated voice prompt driven process without the equipment, hosting, programming or recurring maintenance costs using CCAvenue PhonePay. A dedicated team of experts, ready to help. We strongly believe that In Your Success Lies Our Success. Our experienced team of engineers is empowered to solve your queries using email, chat and telephone - whenever you need it, 24x7x365. We also have dedicated relationship managers allotted to clients with huge volumes. No scripted answers or one-size-fits-all solutions here - just the support your business needs.